All Web addresses mentioned were functional as of 4-29-16. From the Cumberland Gap to the Atlantic Ocean, this is Virginia Water Radio for the week of May 2, 2016. This week, we start with several ordinary Virginia sounds that are so extraordinarily important they’re getting their own special week from May 1 to May 7. Have a listen for about 20 seconds. Every day, Virginians and people throughout the United States depend on sounds like the ones you just heard—a faucet, a shower, filling a water bottle at a fountain, and water poured into a drinking glass. As the recent drinking-water lead-contamination crisis in Flint, Michigan, has tragically underlined, having a safe and reliable product in our water pipes and faucets is vital for families, public health, and community well-being. To increase awareness of the role of public water supplies, Drinking Water Week is held every year during the first week of May. The initiative is organized by the American Water Works Association in cooperation with government agencies and local water suppliers. Virginia participants in 2016 include the City of Charlottesville, Fairfax Water, and several others. The theme for 2016 is “Your Water: To Know It is to Love It.” And there’s a lot you might want to know about your water! Here are a few things to consider: Is the source groundwater or surface water? Who’s the water supplier? How does the supplier treat the water, measure its quality, and report the results? And what laws and agencies regulate drinking water and its sources? With all those aspects of drinking water and water supplies, every week could stand to have some drinking water awareness! We close with part of “Second of May,” by The Steel Wheels of Harrisonburg, from the October 2014 “Live at Goose Creek” concert in Loudoun County. Fitting for the date of this episode, and recorded in a concert honoring a Virginia stream and water source, the recording even includes the faint sounds of a thunderstorm—perhaps, someone’s future drinking water. Thanks to The Steel Wheels for permission to use this music, and here’s to an informative Drinking Water Week. “Second of May” by The Steel Wheels is from the album “Live at Goose Creek,” recorded October 10, 2014, at Franklin Park Performing Arts Center, Purcellville, Va., and produced by Goose Creek Productions; used with permission of The Steel Wheels. More information about The Steel Wheels is available online at http://www.thesteelwheels.com/. “Riverside,” another selection from that Steel Wheels concert, was featured in Episode 286 (10-19-15), on Loudoun County’s Goose Creek. Thanks to the Virginia Water Resources Research Center’s Spring 2016 intern, Taylor Richmond, for her help with this episode. American Water Works Association’s Drinking Water Week logo for 2016. Accessed online at http://www.awwa.org/resources-tools/public-affairs/public-affairs-events.aspx, 4/29/16. Some historical perspective on drinking water and water supplies. 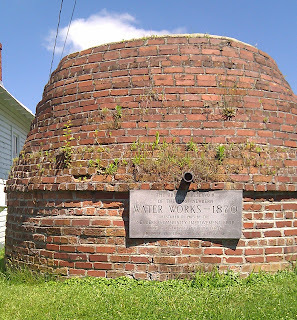 Upper photo: historic reservoir structure in Newbern (Pulaski County), June 22, 2013. Lower photo: Historic spring house in Winchester, Va., March 24, 2008. Drinking water is regulated under the federal Safe Drinking Water Act, which in Virginia is administered by the Virginia Department of Health. For more information, see Virginia Department of Health (VDH)/Office of Drinking Water, online at http://www.vdh.virginia.gov/odw/, or contact your local VDH office. Water quality in surface water falls under the federal Clean Water Act (CWA), which in Virginia is administered primarily by the Virginia Department of Environmental Quality (DEQ), although other agencies are also involved, including the Virginia Department of Mines, Minerals and Energy in coal-mining areas of Virginia (see Virginia Department of Mines, Minerals and Energy/Division of Mined Land Reclamation, “Water Quality,” online at https://www.dmme.virginia.gov/DMLR/DmlrWaterQualityPage.shtml); the Virginia Marine Resources Commission in areas used for shellfishing or in other coastal fisheries; and the VDH in regulating beach closures. Groundwater is not explicitly regulated by the CWA. Other state and federal laws also have an impact on surface waters and groundwater. For more information on the many DEQ programs and activities related to water, see Virginia Department of Environmental Quality, “Water/Resources and Links,” online at http://www.deq.virginia.gov/Programs/Water/ResourcesLinks.aspx. Protection of groundwater that is a source for a public water supply is addressed in the Safe Drinking Water Act. For more information, see VDH/Office of Drinking Water, “Source Water Protection Program,” online at http://www.vdh.virginia.gov/ODW/SourceWaterProtection.htm. The U.S. Environmental Protection Agency (EPA) has federal oversight over state administration of the SDWA and CWA. EPA information on the SDWA and CWA, respectively, is available online at https://www.epa.gov/sdwa and https://www.epa.gov/laws-regulations/summary-clean-water-act. American Water Works Association, “Drinking Water Week/History,” online at http://www.awwa.org/resources-tools/public-affairs/public-affairs-events/drinking-water-week.aspx. AWWA-Va. section, “Drinking Water Week,” online at http://www.vaawwa.org/resources/dww/. U.S. Centers for Disease Control and Prevention (CDC), “Drinking Water/Public Water Systems” online at http://www.cdc.gov/healthywater/drinking/public/index.html. U.S. CDC, “Drinking Water Week Feature for 2015,” online at http://www.cdc.gov/Features/DrinkingWater/. U.S. CDC, “Healthy Water/Drinking Water Week,” online at http://www.cdc.gov/healthywater/observances/dww.html. “Water Resources of Virginia,” U.S. Geological Survey, online at http://va.water.usgs.gov/. This is the home page for the U.S. Geological Survey’s Virginia Water Science Center. All Water Radio episodes are listed by category at the Index link above (http://www.virginiawaterradio.org/p/index.html). See particularly the “Community/Organizations” category for episodes related to function of various agencies; and the “Rivers, Streams, and Other Water Bodies” category for episodes related to specific watersheds and other water features. Fix-a-Leak Week – Episode 307, 3/14/16. Water supply planning - Episode 261, 4/13/15. Winter precipitation and water supplies – Episode 258, 3/23/15.